I gave Bethesda a B+ because for some reason they decided to reveal Fallout 4 a week prior to E3. Why? DOOM was basically a given to be at the show already, as was Fallout to an extent. But I feel like the reveal sort of lost some of its luster because it was unveiled a week early. 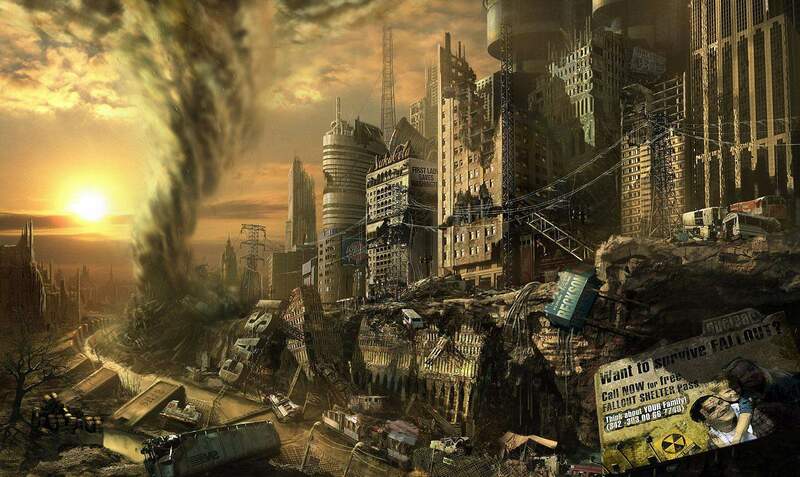 That being said, Fallout 4 looks promising. I’m not a huge Fallout fan (I spend way too much time in Tamriel), but nothing about it says “you should be worried.” I’ll admit I was skeptical of the graphics after watching the first trailer (and still I feel they can be better), but by no means are they bad . . . or even mediocre. And besides, isn’t that what mods are for? Especially since mods are no longer limited to just PC gamers (XB1, I’m looking at you)! Now into the gates of hell we go! DOOM was fantastic. I don’t even think I need to say anything else about it. 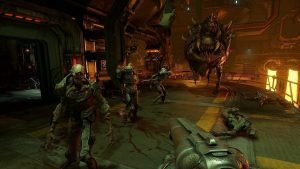 Fast-paced, awesome as all hell (pun intended) combat that says “f*** you” to cover, regenerating health, aiming down the sights, and only being able to carry a couple of weapons — essentially throwing out all the “advancements” the genre has made since CoD became the top contender (in terms of pure sales, at least). New features such as the brutally beautiful executions that have you ripping demons in half only add to the already exciting gameplay. Just for good measure, they threw in an easy to use map maker, too . . . for infinite replayability. I can’t wait to play this. Unfortunately, the middle of Bethesda’s conference (opened with DOOM; closed with Fallout) was lacking. Battleborn looks weak — though it’s in Alpha at the moment, so a lot can change (and it’ll need to change a lot with the sudden influx of “TF2 meets LoL” games we have being shoved in our faces). ESO was basically just done as an advertisement to say, “Hey, we launched on console — and we’re releasing a few things in the coming months.” Zzz. Dishonored 2 revealed with a nifty cinematic trailer, but that was really about it. To anyone that thinks Microsoft had one of their best E3’s I say, “WHAT WERE YOU WATCHING? !” No, really. What were you watching? There were absolutely no surprises — at least not any worth being excited about like some of the other showcases (Sony, I’m looking at you again). Start the show with Halo 5, have some stuff that everyone already knows about in the middle — like Forza, Tomb Raider, and The Division — and end with the Gears of War 4 demo. Eh. Whatever. Granted, all of these games (sans one) look great. The HoloLens demo was nifty as hell, too — though I’m not sure it’s really very practical, and it’ll probably end up somewhere in the peripheral graveyard along with the Kinect and Virtual Boy. Overall, it was a very solid showing for Microsoft — solid, but safe. Aside from the HoloLens, nothing was a surprise. 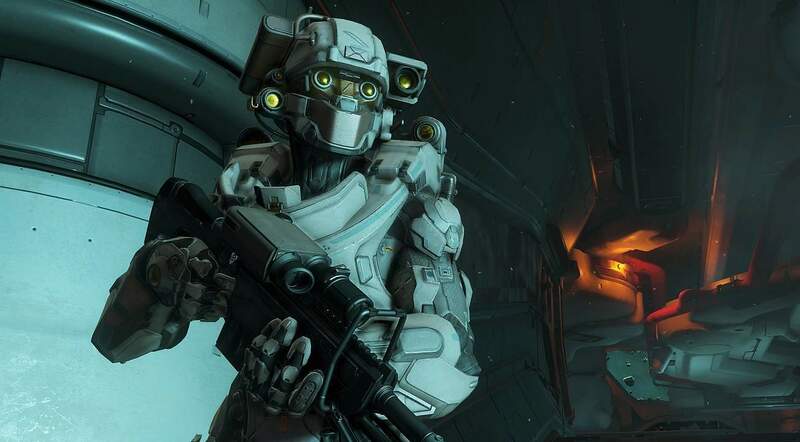 Everyone knew we’d see a ton of Halo 5, Tomb Raider and Forza footage. And as great as they all look (and probably will be), they’re not reinventing the wheel. I’m a huge fan of both Halo and Forza, but they don’t get me excited anymore. All the Halo games play the same. Oooh, but there’s a new protagonist! Chief is the bad guy now! Yeah, no he’s not. That’s also not enough of a story twist to make me interested. At this point, I would only play it because it’s Halo — and I know it’s going to play incredibly well and just be fun. Bungie built a solid base, and 343i is capitalizing on it. Now, if we could only say the same for Black Tusk Studios — or as they’ve recently renamed themselves, The Coalition (horrible, by the way). If I’m a huge Halo fan, I’m a MASSIVE Gears fan. I had trouble getting into the first one, mostly due to the way it played. 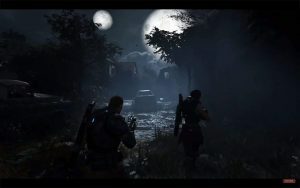 Epic made some adjustments, though — and upon trying out GoW2’s Horde mode, I was hooked forever. I can’t even tell you how much time I’ve sunk into that Horde mode or the campaigns of GoW2 and 3. They’re probably my two favorite games on the 360. So naturally, I was excited for the next iteration — even if it was being handled by a new studio. 343i did great with Halo, though — so I had reason to be optimistic, right? Wrong. And that’s not just a 2+3=4 wrong; that’s a “dude, you failed the ENTIRE test!” wrong. The Coalition made Gears fans cringe. No Marcus. No Dom. No Baird. NO COLE TRAIN!? Fine. I get it. The Gears story we all know and love was a trilogy. The COGs were disbanded and the Locust defeated. These new characters though . . . no. Just no. They didn’t seem to have chemistry the way Marcus and Dom did. The new enemy looked generic and boring — definitely not worthy of the Gears world. The environment looked somewhat nice, but I wasn’t blown away. The demo they showed was just awful. It wasn’t even interesting — all of the above aside. It was just boring. Run, run, walk, walk, run, walk, saw a gate open, walk, touch some goo, walk, run, run, shoot, get mauled, end. GEARS 4, LADIES AND GENTLEMEN! At least Microsoft announced backward compatibility, which may actually get me to buy an XB1 . . . so I can play Gears 2 and 3 again. Solid show — but again, too safe. I’ll admit I didn’t even bother watching the Nintendo broadcast, which is a first for me. Not that I’m a Nintendo fanboy or anything, but they always put on the most entertaining and exciting shows year after year. Fils-Aimé has probably the best stage presence out of any presenter in E3 history. He’s incredible to watch and always hilarious, as are the Nintendo presentations. This year was no different for Nintendo, with the Jim Henson Star Fox stint. That was cute and great. Too bad I can’t say the same for anything else that happened in their showcase. Speaking of which: Nintendo, PLEASE do an actual live showcase next year. Recording your video and making everyone watch it on the web just isn’t the same. I get why you don’t want to do it, but come on! Do it for the fans! Okay, back to the games. Where were they? Nintendo. You do one thing right, no matter what. You make the best games, consistently, forever. Where were they? 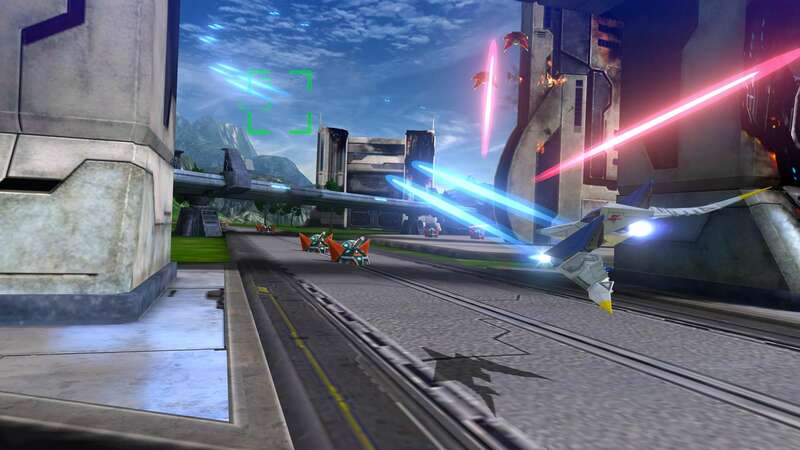 I was beyond excited to see what you’d do with Star Fox, and I was horribly let down. The trailer was too long, unexciting — and it looked like someone made a modded version of Star Fox 64 that included a chicken tank. The genre skipped two entire console generations — one of which was the longest in history — and this is what you give us? Shame on you. Continuing with the theme of shames, what in the hell was that Metroid? Do you know who wanted that Faketroid, Nintendo? No one. Not one single person wanted that. Everyone who cared (and that’s a lot of people) wanted a TRUE Metroid game. Whether it was in the same vein as the Prime series (one of the best trilogies in all of gaming) or back to the 2D era of Super Metroid (possibly the best game of all time), people wanted a new Metroid. Surely Nintendo couldn’t mess that up, right? They would definitely deliver, right? They always do. Wrong. If you thought the Gears 4 reveal was bad, you hadn’t seen anything yet. 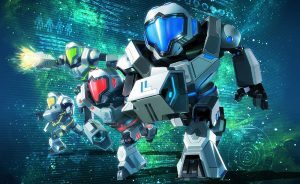 Metroid Prime: Federation Force! A 3v3 sports shooting game! Exactly what everyone wanted! Wait, what? I’ll just let that sink in. . . .
. . . Good? Ok, now that you have just witnessed the most disappointing reveal of the show, I’ll actually say this: Nintendo may be genius. They’re developing a new Metroid game. I still have no doubt about that; even though the Prime producer stated they aren’t (although he wants to finish the story and is entirely open to making another), they are. When will we see it? Next year. Nintendo will reveal the “NX” and will naturally have to show some games for it. What better way to sell a new system than a game series everyone is clamoring for? The next Metroid will be revealed as a launch title for NX at E3 next year. Mark my words. Oh, and to back that up, the Prime producer said they wouldn’t be making a Metroid game for Wii U — and it would most likely be on NX. Need I say more? ANYWAY, if those two weren’t already sad enough, there was no footage of the Wii U Zelda. Not even new screenshots. No information. Nothing. 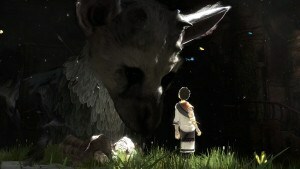 How is it that you reveal the game at last year’s E3, showcase all this beautiful open-world gameplay and new art style, and have literally nothing to show us this year? Yes, we know it’s in development, we know you aren’t ready to share all the information with us, and we know it’s not coming out this year — but for the love of all that’s holy, give us something! Instead, we got Triforce Heroes. Another DS game. Zzz. I can’t talk about Nintendo anymore; it’s making me too depressed. You get a D-, Mr. Iwata. You and Reg dropped the ball big time this year. I look forward to your showcase more than anyone every single year, and you never disappoint — but this year? Please don’t let it happen again; my heart can’t take it. Most of what Square had to show was already teased or shown in the other showcases. Hitman looks good (though I’m not a fan of the series), as does Tomb Raider. World of Final Fantasy is, well, interesting . . . to say the least. Not really my cup of tea, though. Deux Ex looks like a worthy sequel to the prior game. The big hitter here for me (and most people, I think) was Kingdom Hearts 3. I’ve been waiting for this game for more than 10 years. That’s an insanely long time to wait, and it looks like it’s going to be worth it. 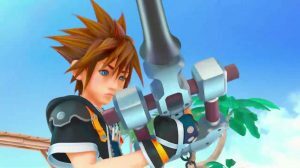 The game looks absolutely gorgeous, and Sora’s new tricks look fantastic. I just wish they would have told us some more information about the game, since they essentially said nothing except that Tangled was going to be one of the new Disney worlds to visit. I honestly have never cared for Ubisoft. I never watch their showcase — and I generally don’t care what they announce or have to show, since I don’t know the last time I even played a Ubisoft game. Whatever. EA was pretty typical for me. Again, it seemed to be somewhat like Microsoft’s: solid, but safe. No real surprises. Everyone was expecting some form of Mass Effect announcement, and they got it — though it wasn’t a whole lot. They did the typical EA Sports presentations — showing NHL, FIFA, Madden, etc. . . . which all look like more of the same. At least they recognize their failures with last year’s NHL and have remedied them. Unravel looks like a Yoshi’s Wooly World wannabe. Need for Speed was supposed to be “reinvented,” but I didn’t quite see that. They had a neat trailer for the new SWTOR expansion, which was announced to be free to all subscribers of the game. Good on EA for that one. I’d be stoked if I actually played the game. Finally, we come to the real reason(s) anyone watched this year’s EA showcase: Battlefront and Mirror’s Edge. I’ll go with Battlefront first. Let’s just say, the initial reveal of Battlefront wasn’t very promising. It raised more concerns than it should have and left people feeling incredibly skeptical — and rightfully so. Luckily, Dice seemed to listen — even if only somewhat. The gameplay shown at E3 looked great. There’s so much going on in a battle at any given time that it would be hard to not be entertained. Unfortunately, it also still resembles a Battlefield mod rather than a completely epic and insane Star Wars: Battlefront game. It looked improved — but if you ask me, it still has a long way to go. 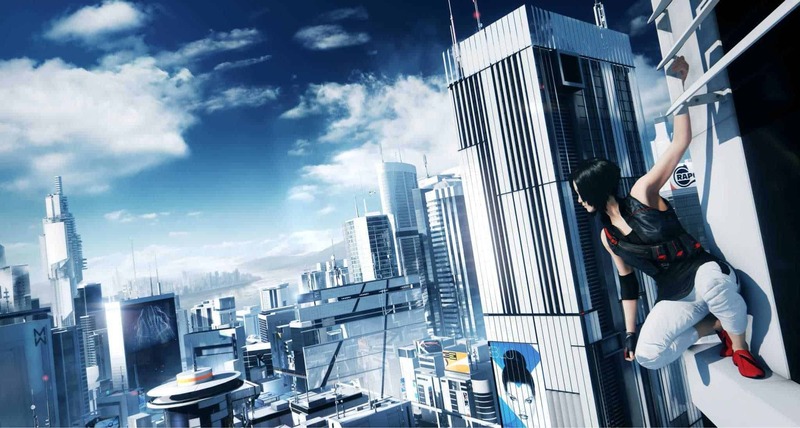 For me, the best game EA had to show (and possibly one of the best at E3) was Mirror’s Edge: Catalyst. Wow, just wow. The original is in my top 5 games of all time. I’ve played through it countless times and to this day still marvel at the visuals. I’ve been waiting for this sequel almost as long as I’ve been waiting for a Kingdom Hearts sequel — and like Kingdom Hearts, this looks like it was well worth the wait. For the first time, E3 held a PC gaming show which spanned a lengthy three hours. Surprisingly, it wasn’t half bad. Exciting? Eh. Neat? Sure. Surprising and shocking? Well, there was nothing from Valve — so no. That being said, the show was still solid. The list of games is too long to recount, but there were lots. The setup was a bit off for me, though. Jeannie and Luis mentioned that it seemed like watching Leno, and this basically hits the nail on the head. The show followed a talk show format. That’s not necessarily a bad thing, since it’s a pretty safe format to follow — but it isn’t a good thing, either. It made all the reveals lackluster — even the one that No Man’s Sky was coming to PC. I’d suggest showing certain trailers first before calling the developers onto the stage, having them make an announcement, or give info/answer a few questions, and then showing a trailer. Also, due to the format, it seemed like the show dragged on too long. Three hours is a long time to begin with (most other showcases are an hour to an hour and a half), so naturally it would be hard to keep everyone’s attention for that long. Of course, if Valve had anything to say, that also could have been different — but we all know that’ll never happen. Anyway, it was neat — and some of the games look interesting. I look forward to next year’s show and the changes they’ll undoubtedly undertake to make the show even better. Need to save the best for last, right? Sony, without a doubt, “won” E3 this year. There’s no contest. They had the only real surprise of the show, brought a game back from the dead, and showed everyone more of what they had already known existed and were foaming at the mouth for. Done deal. Oh but wait: Next up, they had a new IP in the form of Horizon Zero Dawn — or as I like to call it, Cavemen vs Transformers. I’m not really sure what we watched, but it was awesome. Taking down giant dinosaur robots with a bow and arrow in what looks like (thanks, Reddit) a post-apocalyptic London has never looked to be more fun. One of the best new (and only) IPs at the show. I’m definitely looking forward to this one. Sony continued on with some other, more typical games. They showed the new Destiny expansion, The Taken King — which may interest some (although for me, the game is all but dead); took a firm stand that THE place to play CoD was on PS4 from now on (huge considering it used to be Xbox); and let people know about their PS exclusive Arkham Knight content. 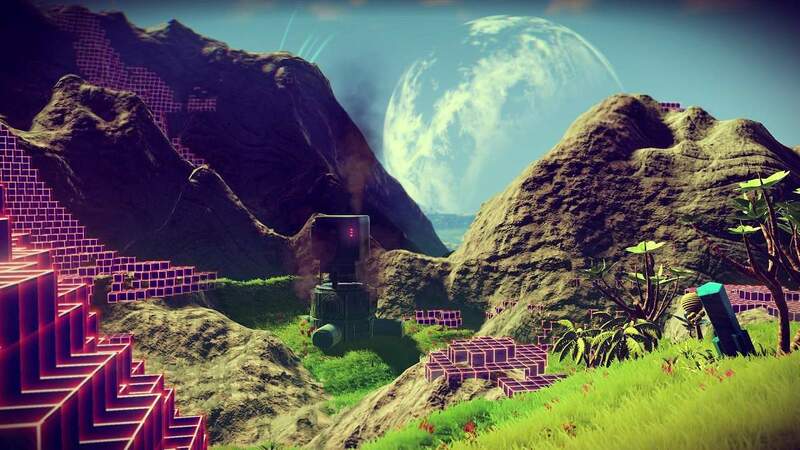 They showcased more of No Man’s Sky, another new and incredible looking IP. This one is on my top five list for the future. WIth an essentially infinite amount of planets to explore in this game’s beautiful art style, I’ll be set for months (maybe more). Sony ended well, too — with a new gameplay trailer for Uncharted 4. The game plays like a movie, it seems. At various times throughout the trailer, I thought this to myself — and that’s not a bad thing. I’ll take a 20+ hour movie that I control for the price of three IMAX tickets any day, especially when it looks this good. They did have a minor blunder initially while trying to play the Uncharted trailer — though the trailer itself made up for it, and no one was worse for the wear. And that about wraps it up I think. Unless I forgot. . . .
. . . GOTCHA! Of course I didn’t forget the biggest two announcements of the show. How could anyone forget. F*@#)! )!#* FINAL FANTASY VII REMAKE!!!!!!!!!!!!!!!!!! Watching it live, I thought they were about to show the new Kingdom Hearts based on the “a franchise we all know and love” (or whatever it was) line. But no. It wasn’t that. As soon as I heard that familiar piano riff from Advent Children, I knew. Everyone knew. It was really happening. And this isn’t going to be just a higher resolution game with better textures and sound sort of remake. No, no — this is a full-fledged graphical upgrade with (so far) unannounced additions and enhancements in other departments. This is how all remakes should be. This was absolutely the biggest surprise of the show. No one saw this coming. Sure, everyone wanted it to happen — but no one actually expected it would. They could have stopped right there and won the show with that alone. But they didn’t. They kept going and announced Shenmue III. SHENMUE III. Yes, that’s right. Two of the most important games from the Dreamcast (and that era of gaming, for that matter) are finally getting a well-deserved sequel. Oddly, though, Sony announced it as a Kickstarter. This took most people by surprise, and was almost insulting in a way (I thought) to the devs. “Sure, we’ll back your game . . . if you meet the goal on Kickstarter, because we don’t trust you enough to make a game that’s going to be worth the investment.” That’s sort of how it came off. Not like it mattered; it smashed the previous Kickstarter record and funded $1 million in around nine hours. Shenmue III is happening. They came, they saw, they delivered everything we wanted and more. Sony had the only real surprises of the show, and this left a lasting impact. Surprises are what E3 is all about. Sure, it’s nice to get more info on games that you know are already in development, but E3 isn’t E3 without a few incredible surprises. It’s the most fun part for me — seeing the next incredible IP unveiled or a new sequel to a beloved series unexpectedly announced. 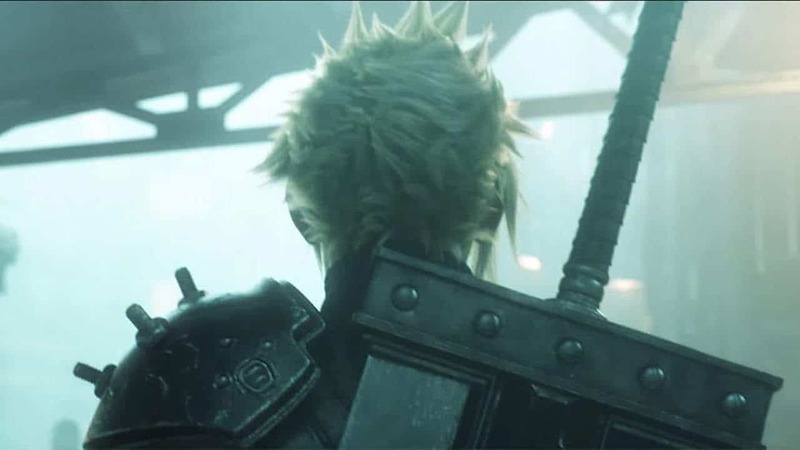 It’s all about that feeling everyone had when the FFVII remake was shown for the first time. That feeling is the best part of E3. And that’s why Sony took the crown this year. I give this year’s E3 a C overall. Sony won because it had amazing surprises up its sleeve — but this was it, I felt. 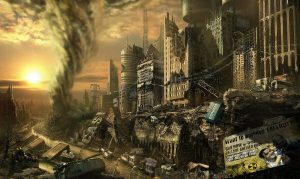 Fallout was announced early, DOOM was expected — as was Halo, Gears, Last Guardian, Kingdom Hearts 3, and some others. There were many leaks prior to the start of the conference that killed a lot of the fun, and then there was Nintendo that just completely dropped the ball on everything when they usually kill it. Definitely not the best year for E3, but not the worst. I’d like to see more risk next year. Take a chance on some new IPs and let them fuel the hype train. Sequels aren’t the only things that will sell. Having surprise reveals isn’t a bad thing. We don’t need to just hear about games we already know are in development and launching soon. Bring the surprise, and the excitement comes with it . . . and so will the sales. And now, since it’s after 1:00am, I’m going to go to sleep. It was a good week to be a gamer. Goodnight. PS: My top 5 Games of E3 2015!